As Benjamin Sepulveda, Marcela Naveas, and Javiera Alvarez, from Santiago, Chile, taught Lindsay Sterling in Portland, Maine. 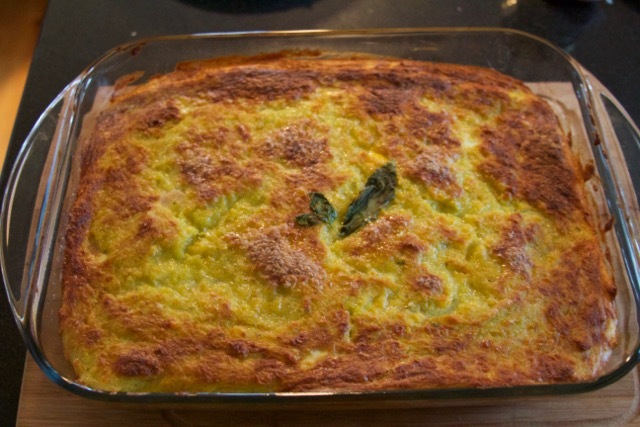 Note: Easily make this dish for 8 by doubling the amounts and using a large casserole dish or two pie plates. measuring spoons -- or just eyeball it! 3. Preheat oven to 350°F. Cook the ground corn and basil in a medium pot with the milk for 20-30 minutes on medium-low until the mixture thickens. 4. Hardboil the eggs, and boil the chicken. You can do this together in one pot. (Cover both with water, add 1 tsp salt, and bring to a boil. Once boiling, turn heat down so water is simmering). Once water boils, set a timer for 14 minutes. 5. Dice the onion. In large saute pan, saute the onions in 1 Tbsp oil. When the onions are soft, add ground beef, 1/2 tsp salt, 1/4 tsp pepper, 1/2 tsp cumin, 1 Tbsp paprika, and 1 tsp oregano. Saute, stirring occasionally until the ground beef loses all its pinkness. 6. When the timer goes off, remove the chicken from the broth and cut into to it to see if it's done (opaque throughout). Cover the eggs in cold water. Peel the eggs. Slice the chicken and eggs into 1/4-inch pieces. 7. 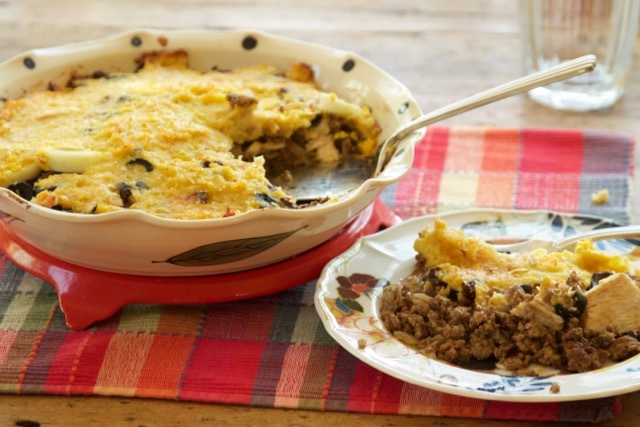 Make the following layers in a deep pie dish or oven-safe baking dish: beef and onions on the bottom, then the chicken slices, then egg slices, olives, and raisins. Cover everything in the corn porridge. Sprinkle the top with sugar. Bake for 20-30 minutes until golden. Broil the top for extra crispy texture. Please help improve this recipe for others by sharing your suggestions in the comment box below.